"When I took over the reins of the company in 2003, I saw a great deal of potential for growth, but knew that we needed to alter and improve our strategy if we wanted to be recognized as industry leaders. I was tasked with the mission to stabilize the company and turn it from a company incurring losses to a profitable organization. My journey into the hospitality industry began with Gulf Air and from there I moved on to Qatar Airways. While at Qatar Airways, I also served as a board member for Katara Hospitality– known as Qatar National Hotels Company (QNH) back then," recalls H.E. Sheikh Nawaf Bin Jassim Bin Jabor Al-Thani, Chairman of Katara Hospitality. "Although I graduated with a Bachelor of Commerce degree in Business Administration from Qatar University, I have always been fascinated by the hospitality industry. Privileged to be a seasoned traveller from a young age, my passion for travel and tourism is innate." Sheikh Nawaf is a big believer in Qatar's potential- he's quick to point out that it's one of the fastest growing countries in the world, adding that the hospitality industry in specific is on the ascending slope. "My mission was quickly accomplished and as we started growth, we undertook strategies that would place us on the global map." Indeed, hospitality is one of the most lucrative industries in the world, and one that continues to offer immense potential for those willing to invest confidently and manage those investments with flair and professionalism. "We know that we are investing today for future generations, and it is this awareness that drives our passion for success and commitment to the highest standards of business and service industries," explained Sheikh Nawaf. In 1970, the Qatari government established Qatar National Hotels Limited to manage the Gulf Hotel (today the Doha Marriot). At the time, the Gulf Hotel was the country's first five star hotel. Their website states that Katara Hospitality has adopted a pioneering approach from the start, basically leading the industry in Qatar and now looking to compete globally. Several firsts, including being the first to bring in a branded hotel chain, are milestones for Katara. 2001 marked the opening of the tallest hotel in Qatar at the time, The Ritz- Carlton, and Sealine Beach Resort was the first leisure resort in Doha. Another first? Sharq Village & Spa was the first high-end resort, including the Six Senses Spa, which was regarded as the largest of its kind in the region. "Since announcing our rebranding to Katara Hospitality in May 2012, we have continued the journey of expansion, not only in Qatar but also internationally. With the aim to become one of the leading hospitality organizations in the world, we have created an iconic collection of hotels spread across 11 countries on three continents." Six Senses Spa. Image credit: Katara Hospitality. Their long history in the Gulf state has given them a regional foothold, and a bridge to international property success, says Sheikh Nawaf. "Having been at the forefront of the hospitality industry for more than 40 years, Katara Hospitality has built a portfolio of iconic hotels in Qatar and key international gateways. As experienced hotel owners, developers and operators, we are seen as a hospitality pioneer in Qatar." He adds that the Qatar National Vision 2030 will lead the country on the path of economic diversification, and the hospitality industry is regarded as one of the strategic drivers in the platform implementation. "We are a government-owned organization whose goals are naturally aligned to the country's objectives," and for this reason, Katara Hospitality is committed to develop their contribution for the burgeoning Marina District of Lusail City. With the current construction of Katara Towers in Lusail Marina District, Katara Hospitality is seen as one of the first investors that understood the significance of the Lusail City project, called "a natural extension" of Doha. Lusail City, discussed as a business and residential arena, is being touted as an element of attraction for investment in the tiny country. "The world's most loved cities are often identified through their imagery and landmark buildings. We strongly believe the Katara Towers, Lusail Marina District will provide Qatar with an architectural symbol that is recognized and understood right across the globe," continues the Sheikh confidently. 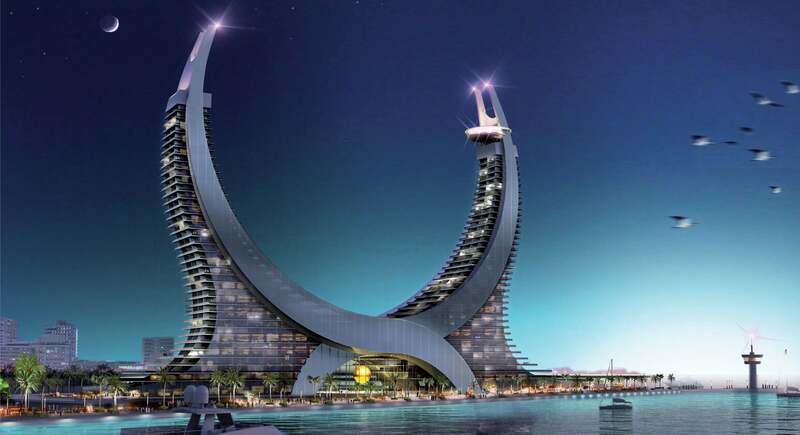 The Katara towers "are an architectural translation of Qatar's national seal, representing the traditional scimitar swords," and purported to be "symbolically intertwined with Qatar's heritage." The group currently owns and/or manages "more than 6,000 four and five star hotel rooms spread across three continents," and are honing their interests on international expansion. Sheikh Nawaf highlights that Katara is continuously looking to invest in unique hotel properties, both in Qatar or in key sought-after international locales, as long as they are aligned with the company's ethos and brand values. "We acquire and further invest in properties that have set the standards in the industry, as we work to create an enviable portfolio of iconic hotels around the globe." Katara Towers Lusail Marina District. Image credit: Katara Hospitality. Accordingly, when it comes to the strategy for investing abroad, Katara Hospitality doesn't just focus on acquiring hallmark properties- they're also creating hospitality icons from scratch or turning assets designed for other purposes into true hospitality gems. Sheikh Nawaf uses Tazi Palace in Tangier as primary example; the property was originally designed to become a royal residence and will be transformed into a luxurious palace hotel. "Having said that, Qatar will always remain a top priority for us, no matter how far we fly our flag. Qatar is our homeland, and we believe we have a duty to bring our contribution to developing a strong and healthy nation. Importantly, our Qatar portfolio ensures a sustainable base of hotels that will always support our international ventures." At present, Katara Hospitality owns 18 international properties throughout Europe, Asia, and the MENA region. In Europe, their properties spread across France, Italy, Switzerland, Netherlands, Spain, Germany, in addition to hotspots like Thailand and Singapore, and finally North African destinations Egypt and Morocco. "We also have a couple of other international properties in the pipeline which will be announced once agreements have been finalized." Given that Katara Hospitality is government-owned, the organization is helping to fulfill Qatar's strategic vision of economic diversification. "As the hospitality arm of the Qatar Sovereign Wealth Fund, we identify strategic investment opportunities in other markets. We are optimizing our international investments in order to make the best possible returns for investors and shareholders, whilst at the same time safeguarding our economic future." The Group is also aligned with other values and objectives of the 2030 Qatari National Vision, including Qatarization policies. "We work with Qatari high school graduates and undergraduates at Stenden University Qatar, encouraging them to pursue a career in the hospitality sector. The initiatives that we run with talented Qatari students are one part of a larger puzzle to develop a dynamic and efficient workforce for Qatar." Qatar's hospitality sector is tilted towards serving the upper end of the market– more than half of the new hotels being planned over the next five years will be five star properties. Sheikh Nawaf agrees that "there is definitely need for more balance. Recent hospitality market trends in Qatar and the wider GCC reveal an increase in more cost-conscious travellers, leading to a diversification of the offer under the four and three star hotel segment." Katara Hospitality follows a healthy diversification strategy, aiming to create a network of five and four star business hotels as well as leisure resorts. "We target the luxury market as well as the corporate and leisure segments, covering a wide area of tourist requirements, enhancing the cash flow projections to support the company's development and ensuring a balance is met across assets of short and long-term profitability." 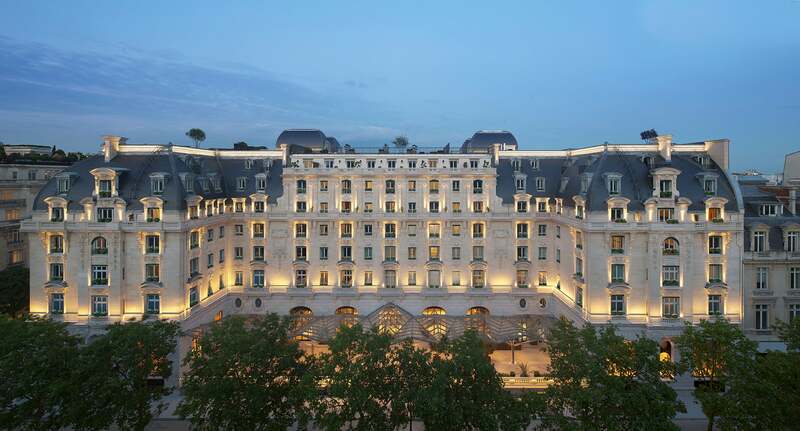 The Peninsula Paris. Image credit: Katara Hospitality. The hospitality industry both in Qatar and across the globe has become increasingly competitive, and Sheikh Nawaf maintains that one of the great challenges for a hotel in any market is competitive differentiation. "As Qatar's economy grows steadily and the country plans to host the FIFA World Cup 2022, we see an unprecedented growth in high-profile hospitality projects and each hotel must decide how to be more innovative and different from its competitors." As new hotels open up in the next few years, the challenge of maintaining competitive room rates while stimulating healthy market competition to maintain service standards will only grow. "Guest needs evolve very quickly in today's environment and hotel managers must keep their strategies flexible and plan for constant change." Another hurdle that the hospitality industry faces? Sheikh Nawaf says that for international hospitality brands setting up in Qatar and other parts of the Middle East, a harder to achieve goal is adapting to local customer preferences. "Global hotel companies looking to succeed in new markets must find effective ways of competing with domestic brands by localizing their service offerings while keeping in line with their global brand values." Throughout the MENA region, there's been talk of talent wars and difficult staffing situations, and the hospitality sector is no exception. Recruiting and retaining top talent is yet another area that hotels in the region are coping with, especially in light of the Qatar World Cup and the Dubai Expo slotted for 2020. One solution, according to Sheikh Nawaf, echoes the recommendation of regional talent experts: "Hospitality organizations must offer learning and growth opportunities to attract candidates. Training and development is important in today's competitive environment, as are steady paths of progression." While the overall GCC hospitality industry challenges are similar to the ones faced specifically in Qatar, hotels in Doha must determine how to keep their offerings innovative and different from competition, while maintaining competitive room rates so they don't lose customers to the ever-increasing number of hotels all over the region. "As Qatar prepares for the strong demand for premium accommodation that the World Cup is bound to stimulate, we are witnessing an unprecedented growth in high-profile hospitality projects- 85,000 new hotel rooms are planned for Qatar ahead of 2022." 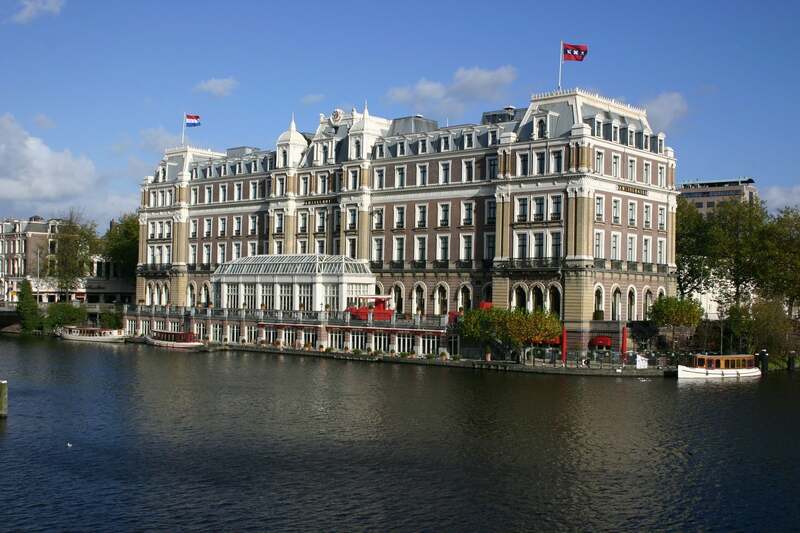 The InterContinental Amstel Amsterdam. Image credit: Katara Hospitality. Sheikh Nawaf cites statistics that indicate good growth: at the end of 2013, four and five star hotels made up 11,717 of Qatar's 13,551 rooms with total revenue of QR3.58 million. The Qatar Tourism Authority (QTA) has announced that a total of 124 new hotels and hotel apartments are planned for the country, bringing an additional 21,402 rooms, suites and units upon completion. In terms of occupancy, QTA says that hotels in Qatar had an average occupancy rate of 65% at the end of 2013- an increase from 60% in 2012, despite an over- all increase in the number of hotel rooms. Naturally, Sheikh Nawaf says that these new hotels will be ideally located for football fans, officials and professionals visiting Qatar for the upcoming World Cup in eight year's time, "but long after the dust of the World Cup has settled, these hotels will be a perfect getaway for Middle East leisure travellers looking for luxury accommodation in Qatar, which continues to expand its tourist offering each year." In 2013, Qatar hosted 1.3 million international tourists, and most of them came from neighbouring GCC countries. "Qatar is well on its way to establishing itself as a global tourist destination, attracting visitors from all over the world. Qatar Airways, for instance, operates on a network of more than 120 destinations worldwide and the airline's continued success enhances Qatar's position as a major global hub for passengers passing through the Middle East." As Qatar's infrastructure develops at a fast pace, the entertainment being offered also diversifies every year. "From high-end shopping malls or traditional souks, world class museums and cultural hubs, to parks and unique outdoor recreational facilities – as well as an increasing portfolio of hotels and restaurant concepts, Qatar has something to offer everyone, whether for residents or tourists." In parallel, Qatar is determined to become a leading global hospitality destination, offering a variety of attractions for both business and leisure travellers. "I believe 2022 is a milestone in our country's development and an opportunity to showcase a country that has grown into an international destination, while its people have an innate hospitability trait. We expect tourist numbers to keep growing steadily, as more and more international visitors are attracted to Qatar's winning combination of world-class hospitality facilities along with a rich cultural heritage." 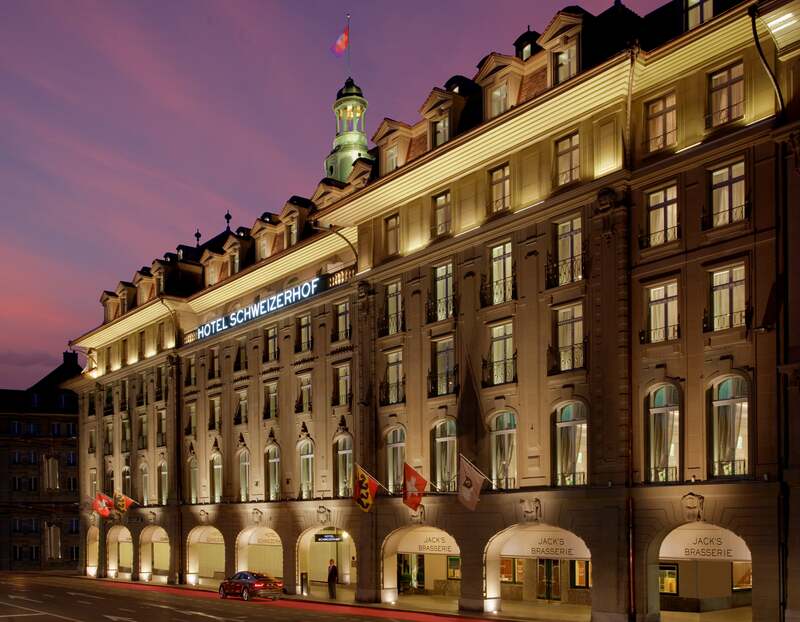 The Schweizerhof Hotel Bern. Image credit: Katara Hospitality. Doha's World Cup 2022 is anticipated to attract approximately one million international visitors, and the Qatari government intends to invest heavily in tourism infrastructure to accommodate that need. As a consequence, the demand for hotel accommodation will rise considerably, as more than 85,000 new hotel rooms are being planned in the next few years. Sheikh Nawaf is reassuring, saying that three star hotels have no reason to feel threatened by four or five star properties being on the rise, since low market supply further pushes up demand by budget travellers. "There is great demand for more budget-friendly three star hotels all over the region Six Senses Spa and occupancy is generally strong in this mid-segment range." Where does he see this going ultimately? Sheikh Nawaf sees only windows of opportunity and room for advancement: "I believe Qatar has the potential to become a leading global hospitality destination for luxury and business travel. Offering a wide variety of hotels and resorts, Qatar can develop its existing competitive advantage of delivering the winning combination of world-class hospitality facilities along with a rich cultural heritage. Tourism development in Qatar is already well under way. With its cultural, historical, shopping and sporting attractions, and an increasingly wide range of leisure facilities, Doha has already developed into a multi-faceted destination for global travellers." As the country strives to achieve the National Vision 2030 of economic diversification and in preparation for the World Cup, the country's hospitality industry is playing a major role in developing Qatar's position as an all-round destination for global travellers in tandem with their citizenry. "We aim to engage in an active dialogue with the local Qatari community, informing them of the social and economic benefits associated with being a leading global hospitality destination." Sheikh Nawaf stresses that they will also create awareness of Katara Hospitality's contribution to the 2030 Qatar National Vision, as the hospitality flagship of the country. "Guided by the vision of His Highness the Emir, Sheikh Tamim Bin Hamad Al-Thani, there is no doubt that Qatar will continue to move steadily towards becoming one of the region's chief economic powers and one of the world's most respected nations."